Jews in the Hungarian Army, 1848. Kingdom in central Europe, forming part of the Austro-Hungarian monarchy. It is not definitely known when Jews first settled in Hungary. According to legend, King Decebalus of Dacia permitted the Jews who aided him in his war against Rome to settle in his territory. A Latin inscription, the epitaph of Septima Maria, discovered within the territory of the ancient province of Pannonia, clearly refers to Jewish matters. But, although it may be unhesitatingly assumed that Jews came to Hungary while the Roman emperors held sway in that country, there is nothing to indicate that at that time they had settled there permanently. In the Hungarian language the Jew is called "Zsidó," a term which the Hungarians adopted from the Slavs. The first historical document relating to the Jews of Hungary is the letter written about 960 to King Joseph of the Chazars by Ḥasdai ibn Shaprut, the Jewish statesman of Cordova, in which he says that the Slavic ambassadors promised to deliver the message to the King of Slavonia, who would hand the same to Jews living in "the country of Hungarin," who, in turn, would transmit it farther (see Jew. Encyc. iv. 3, s.v. Chazars). About the same time Ibrahim ibn Jacob says that Jews went from Hungary to Prague for business purposes. (See Commerce.) Dr. Samuel Kohn suggests that Jewish Chazars may have been among the Hungarian troops that under Arpad conquered the country in the second half of the ninth century. Nothing is known concerning the Jews during the period of the Vajdas, except that they lived in the country and engaged in commerce there. Two hundred years later, in the reign of St. Ladislaus (1077-95), the Synod of Szabolcs decreed (May 20, 1092) that Jews should not be permitted to have Christian wives or to keep Christian slaves. This decree had been promulgated in the Christian countries of Europe since the fifth century, and St. Ladislaus merely introduced it into Hungary. 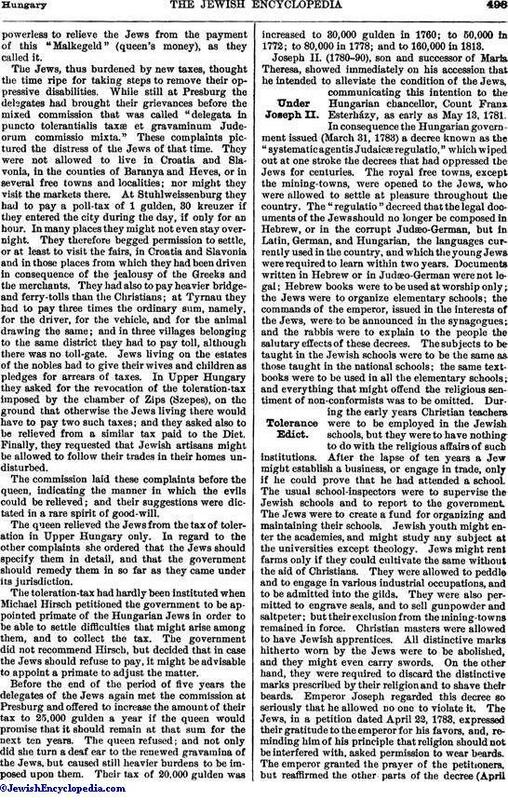 The Jews of Hungary formed at first small settlements, and had no learned rabbis; but they were strictly observant of all the Jewish religious laws and customs. Jews from Ratisbon once came into Hungary with merchandise from Russia, and the wheel of their wagon broke on a Friday, near Ofen (Buda) or Gran (Esztergom). By the time they had repaired it and had entered the town, the Jews were just leaving the synagogue; and the unintentional Sabbath-breakers were heavily fined. The ritual of the Hungarian Jews faithfully reflected their German origin. King Coloman (1095-1114), the successor of St. Ladislaus, renewed the Szabolcs decree of 1092, adding further prohibitions against the employment of Christian slaves and domestics. He also restricted the Jews to cities with episcopal sees—probably to have them under the continuous supervision of the Church. Soon after the promulgation of this decree Crusaders came to Hungary; but the Hungarians did not sympathize with them, and Coloman even opposed them. The infuriated Crusaders attacked some cities, and if Gedaliah ibn Yaḥya is to be believed, the Jews suffered a fate similar to that of their coreligionists in France, Germany, and Bohemia. The cruelties inflicted upon the Jews of Bohemia induced many of them to seek refuge with their treasures in Hungary. It was probably the immigration of the rich Bohemian Jews that induced Coloman soon afterward to regulate commercial and banking transactions between Jews and Christians. He decreed, among other regulations, that if a Christian borrowed from a Jew, or a Jew from a Christian, both Christian and Jewish witnesses must be present at the transaction. During the reign of King Andrew II. (1205-35) there were Jewish chamberlains and mint-, salt-, and tax-officials. The nobles of the country, however, induced the king, in his Golden Bull (1222), to deprive the Jews of these high offices. When Andrew needed money in 1226, he farmed the royal revenues to Jews, which gave ground for much complaint. The pope thereupon excommunicated him, until, in 1233, he promised the papal ambassadors on oath that he would enforce the decrees of the Golden Bull directed against the Jews and the Saracens; would cause both peoples to be distinguished from Christians by means of badges; and would forbid both Jews and Saracens to buy or to keep Christian slaves. The year 1240 was the closing one of the fifth millennium of the Jewish era. At that time the Jews were expecting the advent of their Messiah. The irruption of the Tatars (1241) seemed to conform to expectation, as Jewish imagination expected the happy Messianic period to be ushered in by the war of Gog and Magog. The wild Tatars treated the Jews with great cruelty, although it had been reported that they (the Tatars) were in reality Jews who had been secretly furnished with arms by their European brethren. Béla, IV. (1235-70) appointed a Jew, Henul by name, court chamberlain (the Jew Teka had filled this office under Andrew II. ); and Wölfel and his sons Altmann and Nickel held the castle at Komárom with its domains in pawn. Béla also entrusted the Jews with the mint; and Hebrew coins of this period are still found in Hungary. In 1251 a "privilegium" was granted by Béla to his Jewish subjects which was essentially the same as that granted by Duke Frederick II. the Belligerent to the Austrian Jews in 1244, but which Béla modified to suit the conditions of Hungary (Löw, in Busch's "Jahrbuch," v. 63). This "privilegium" remained in force down to the battle of Mohacs (1526). At the Synod of Ofen (1279), held in the reign of King Ladislaus IV. (1272-90), it was decreed, in thepresence of the papal ambassador, that every Jew appearing in public should wear on the left side of his upper garment a piece of red cloth; that any Christian transacting business with a Jew not so marked, or living in a house or on land together with any Jew, should be refused admittance to the Church services; and that a Christian entrusting any office to a Jew should be excommunicated. Andrew III. (1291-1301), the last king of the house of Arpad, declared, in the "privilegium" granted by him to the community of Presburg (Pozsony), that the Jews in that city should enjoy all the liberties of citizens. Under the foreign kings who occupied the throne of Hungary on the extinction of the house of Arpad, the Hungarian Jews suffered many persecutions; and at the time of the Black Death (1349) they were expelled from the country (see "R. E. J." xxii. 236). Although the Jews were immediately readmitted, they were again persecuted, and were once more expelled in 1360 by King Louis the Great of Anjou (1342-82) on the failure of his attempt to convert them to Catholicism. They were graciously received by Alexander the Good of Moldavia and Dano I. of Wallachia, the latter affording them special commercial privileges. When, some years later, Hungary was in financial distress, the Jews were recalled. They found that during their absence the king had introduced the custom of "Tödtbriefe," i.e., canceling by a stroke of his pen, on the request of a subject or a city, the notes and mortgage-deeds of the Jews. An important office created by Louis was that of "judge of all the Jews living in Hungary," this official being chosen from among the dignitaries of the country, the palatines, and treasurers, and having a deputy to aid him. It was his duty to collect the taxes of the Jews, to protect their privileges, and to listen to their complaints, which last-named had become more frequent since the reign of Sigismund (1387-1437). The successors of Sigismund—Albert (1437-39), Ladislaus Posthumus (1453-57), and Matthias Corvinus (1458-90)—likewise confirmed the "privilegium" of Béla IV. Matthias created the office of Jewish prefect in Hungary. The period following upon the death of Matthias was a sad one for the Hungarian Jews. He was hardly buried when the people fell upon them, confiscated their property, refused to pay debts owing to them, and persecuted them generally. The pretender John Corvinus, Matthias' illegitimate son, expelled them from Tata (Totis), and King Ladislaus II. (1490-1516), always in need of money, laid heavy taxes upon them. During his reign Jews were for the first time burned at the stake, many being executed at Tyrnau (Nagy-Szombat) in 1494, on suspicion of ritual murder. The Hungarian Jews finally applied to the German emperor Maximilian for protection. On the occasion of the marriage of Louis II. and the archduchess Maria (1512), the emperor, with the consent of Ladislaus, took the prefect, Jacob Mendel, together with his family and all the other Hungarian Jews, under his protection, according to them all the rights enjoyed by his other subjects. Under Ladislaus' successor, Louis II. (1516-26), persecution of the Jews was a common occurrence. The bitter feeling against them was in part augmented by the fact that the baptized Emerich Szerencsés, the deputy treasurer, embezzled the public funds, following the example of the nobles who despoiled the treasury under the weak Louis. The Turks vanquished the Hungarians at the battle of Mohacs (Aug. 29, 1526), on which occasion Louis II. was slain. When the news of his death reached the capital, Ofen, the court and the nobles fled together with some rich Jews, among them the prefect. When the grand vizier, Ibrahim Pasha, preceding Sultan Sulaiman, arrived with his army at Ofen, the representatives of the Jews who had remained in the city appeared garbed in mourning before him, and, begging for grace, handed him the keys of the deserted and unprotected castle in token of submission. The sultan himself entered Ofen on Sept. 11; and on Sept. 22 he decreed that all the Jews seized at Ofen, Gran, and elsewhere, more than 2,000 in number, should be distributed among the cities of the Turkish empire. While some of the Jews of Hungary were thus deported to Turkey, others, who had fled at the approach of the sultan, sought refuge beyond the frontier or in the royal free towns of western Hungary. The widow of Louis II., the queen regent Maria, favored the enemies of the Jews. The citizens of Oedenburg (Sopron) began hostilities by expelling the Jews of that city, confiscating their property, and pillaging the vacated houses and the synagogue. 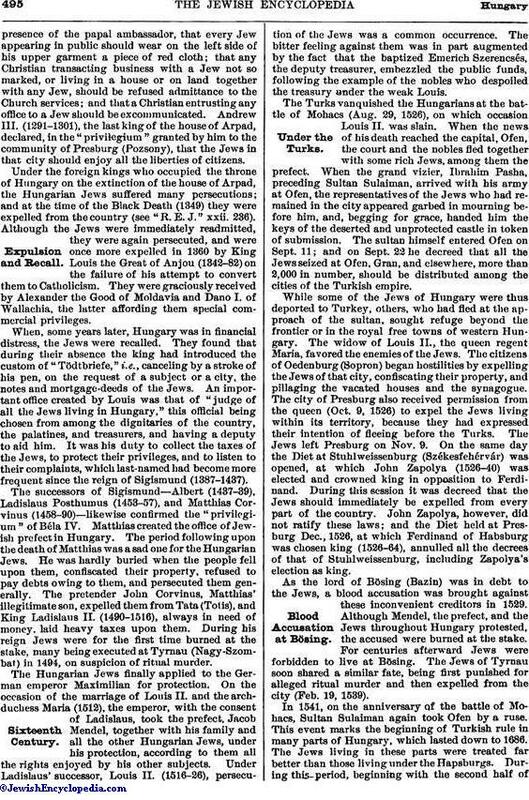 The city of Presburg also received permission from the queen (Oct. 9, 1526) to expel the Jews living within its territory, because they had expressed their intention of fleeing before the Turks. The Jews left Presburg on Nov. 9. On the same day the Diet at Stuhlweissenburg (Székesfehérvár) was opened, at which John Zapolya (1526-40) was elected and crowned king in opposition to Ferdinand. During this session it was decreed that the Jews should immediately be expelled from every part of the country. John Zapolya, however, did not ratify these laws; and the Diet held at Presburg Dec., 1526, at which Ferdinand of Habsburg was chosen king (1526-64), annulled all the decrees of that of Stuhlweissenburg, including Zapolya's election as king. As the lord of Bösing (Bazin) was in debt to the Jews, a blood accusation was brought against these inconvenient creditors in 1529. Although Mendel, the prefect, and the Jews throughout Hungary protested, the accused were burned at the stake. For centuries afterward Jews were forbidden to live at Bösing. The Jews of Tyrnau soon shared a similar fate, being first punished for alleged ritual murder and then expelled from the city (Feb. 19, 1539). In 1541, on the anniversary of the battle of Mohacs, Sultan Sulaiman again took Ofen by a ruse. This event marks the beginning of Turkish rule in many parts of Hungary, which lasted down to 1686. The Jews living in these parts were treated far better than those living under the Hapsburgs. During this period, beginning with the second half ofthe sixteenth century, the community of Ofen was more flourishing than at any time before or after. 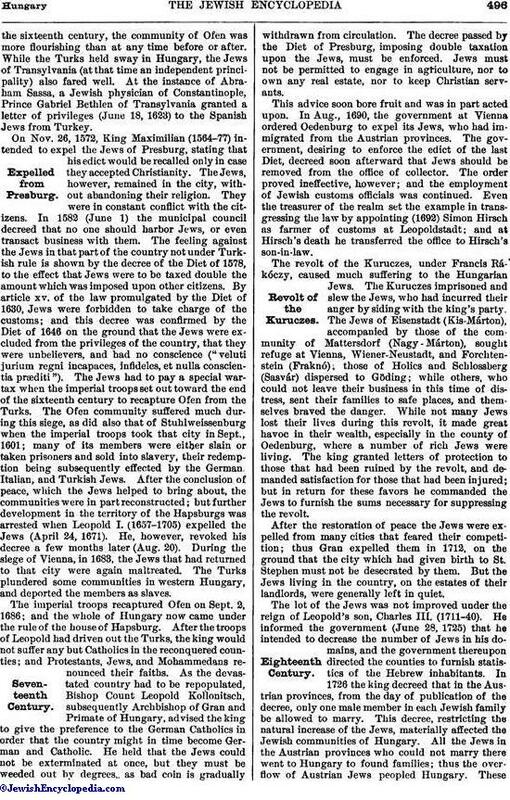 While the Turks held sway in Hungary, the Jews of Transylvania (at that time an independent principality) also fared well. At the instance of Abraham Sassa, a Jewish physician of Constantinople, Prince Gabriel Bethlen of Transylvania granted a letter of privileges (June 18, 1623) to the Spanish Jews from Turkey. On Nov. 26, 1572, King Maximilian (1564-77) intended to expel the Jews of Presburg, stating that his edict would be recalled only in case they accepted Christianity. The Jews, however, remained in the city, without abandoning their religion. They were in constant conflict with the citizens. In 1582 (June 1) the municipal council decreed that no one should harbor Jews, or even transact business with them. The feeling against the Jews in that part of the country not under Turkish rule is shown by the decree of the Diet of 1578, to the effect that Jews were to be taxed double the amount which was imposed upon other citizens. By article xv. of the law promulgated by the Diet of 1630, Jews were forbidden to take charge of the customs; and this decree was confirmed by the Diet of 1646 on the ground that the Jews were excluded from the privileges of the country, that they were unbelievers, and had no conscience ("veluti jurium regni incapaces, infideles, et nulla conscientia præditi"). The Jews had to pay a special war-tax when the imperial troops set out toward the end of the sixteenth century to recapture Ofen from the Turks. The Ofen community suffered much during this siege, as did also that of Stuhlweissenburg when the imperial troops took that city in Sept., 1601; many of its members were either slain or taken prisoners and sold into slavery, their redemption being subsequently effected by the German Italian, and Turkish Jews. After the conclusion of peace, which the Jews helped to bring about, the communities were in part reconstructed; but further development in the territory of the Hapsburgs was arrested when Leopold I. (1657-1705) expelled the Jews (April 24, 1671). He, however, revoked his decree a few months later (Aug. 20). During the siege of Vienna, in 1683, the Jews that had returned to that city were again maltreated. The Turks plundered some communities in western Hungary, and deported the members as slaves. The imperial troops recaptured Ofen on Sept. 2, 1686; and the whole of Hungary now came under the rule of the house of Hapsburg. After the troops of Leopold had driven out the Turks, the king would not suffer any but Catholics in the reconquered counties; and Protestants, Jews, and Mohammedans renounced their faiths. As the devastated country had to be repopulated, Bishop Count Leopold Kollonitsch, subsequently Archbishop of Gran and Primate of Hungary, advised the king to give the preference to the German Catholics in order that the country might in time become German and Catholic. He held that the Jews could not be exterminated at once, but they must be weeded out by degrees, as bad coin is gradually withdrawn from circulation. The decree passed by the Diet of Presburg, imposing double taxation upon the Jews, must be enforced. Jews must not be permitted to engage in agriculture, nor to own any real estate, nor to keep Christian servants. This advice soon bore fruit and was in part acted upon. In Aug., 1690, the government at Vienna ordered Oedenburg to expel its Jews, who had immigrated from the Austrian provinces. The government, desiring to enforce the edict of the last Diet, decreed soon afterward that Jews should be removed from the office of collector. The order proved ineffective, however; and the employment of Jewish customs officials was continued. Even the treasurer of the realm set the example in transgressing the law by appointing (1692) Simon Hirsch as farmer of customs at Leopoldstadt; and at Hirsch's death he transferred the office to Hirsch's son-in-law. The revolt of the Kuruczes, under Francis Rákóczy, caused much suffering to the Hungarian Jews. The Kuruczes imprisoned and slew the Jews, who had incurred their anger by siding with the king's party. The Jews of Eisenstadt (Kis-Márton), accompanied by those of the community of Mattersdorf (Nagy-Márton), sought refuge at Vienna, Wiener-Neustadt, and Forchtenstein (Fraknó); those of Holics and Schlossberg (Sasvár) dispersed to Göding; while others, who could not leave their business in this time of distress, sent their families to safe places, and themselves braved the danger. While not many Jews lost their lives during this revolt, it made great havoc in their wealth, especially in the county of Oedenburg, where a number of rich Jews were living. The king granted letters of protection to those that had been ruined by the revolt, and demanded satisfaction for those that had been injured; but in return for these favors he commanded the Jews to furnish the sums necessary for suppressing the revolt. After the restoration of peace the Jews were expelled from many cities that feared their competition; thus Gran expelled them in 1712, on the ground that the city which had given birth to St. Stephen must not be desecrated by them. But the Jews living in the country, on the estates of their landlords, were generally left in quiet. The lot of the Jews was not improved under the reign of Leopold's son, Charles III. (1711-40). He informed the government (June 28, 1725) that he intended to decrease the number of Jews in his domains, and the government thereupon directed the counties to furnish statistics of the Hebrew inhabitants. In 1726 the king decreed that in the Austrian provinces, from the day of publication of the decree, only one male member in each Jewish family be allowed to marry. This decree, restricting the natural increase of the Jews, materially affected the Jewish communities of Hungary. All the Jews in the Austrian provinces who could not marry there went to Hungary to found families; thus the overflow of Austrian Jews peopled Hungary. Theseimmigrants settled chiefly in the northwestern counties, in Neutra (Nyitra), Presburg, and Trencsén. The Moravian Jews continued to live in Hungary as Moravian subjects; even those that went there for the purpose of marrying and settling promised on oath before leaving that they would pay the same taxes as those living in Moravia. In 1734 the Jews of Trencsén bound themselves by a secret oath that in all their communal affairs they would submit to the Jewish court at Ungarisch-Brod only. In course of time the immigrants refused to pay taxes to the Austrian provinces. 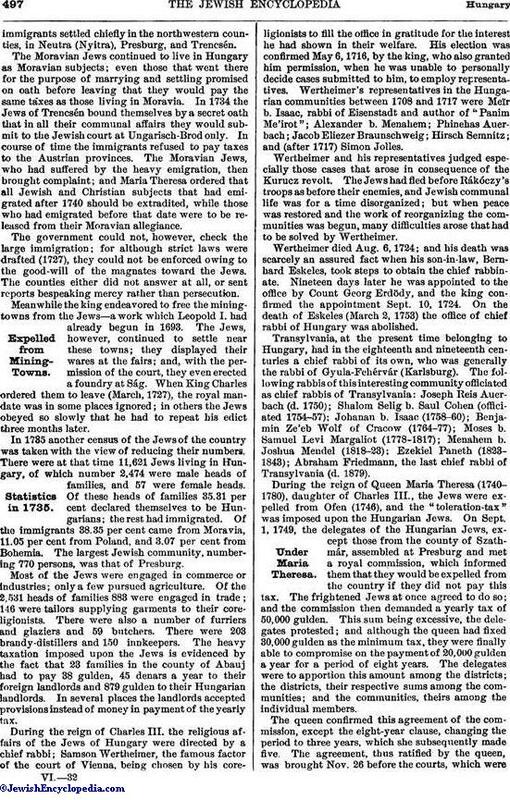 The Moravian Jews, who had suffered by the heavy emigration, then brought complaint; and Maria Theresa ordered that all Jewish and Christian subjects that had emigrated after 1740 should be extradited, while those who had emigrated before that date were to be released from their Moravian allegiance. The government could not, however, check the large immigration; for although strict laws were drafted (1727), they could not be enforced owing to the good-will of the magnates toward the Jews. The counties either did not answer at all, or sent reports bespeaking mercy rather than persecution. Meanwhile the king endeavored to free the mining-towns from the Jews—a work which Leopold I. had already begun in 1693. The Jews, however, continued to settle near these towns; they displayed their wares at the fairs; and, with the permission of the court, they even erected a foundry at Ság. When King Charles ordered them to leave (March, 1727), the royal mandate was in some places ignored; in others the Jews obeyed so slowly that he had to repeat his edict three months later. In 1735 another census of the Jews of the country was taken with the view of reducing their numbers. There were at that time 11,621 Jews living in Hungary, of which number 2,474 were male heads of families, and 57 were female heads. Of these heads of families 35.31 per cent declared themselves to be Hungarians; the rest had immigrated. Of the immigrants 38.35 per cent came from Moravia, 11.05 per cent from Poland, and 3.07 per cent from Bohemia. The largest Jewish community, numbering 770 persons, was that of Presburg. Most of the Jews were engaged in commerce or industries; only a few pursued agriculture. Of the 2,531 heads of families 883 were engaged in trade; 146 were tailors supplying garments to their coreligionists. There were also a number of furriers and glaziers and 59 butchers. There were 203 brandy-distillers and 150 innkeepers. The heavy taxation imposed upon the Jews is evidenced by the fact that 23 families in the county of Abauj had to pay 38 gulden, 45 denars a year to their foreign landlords and 879 gulden to their Hungarian landlords. In several places the landlords accepted provisions instead of money in payment of the yearly tax. During the reign of Charles III. the religious affairs of the Jews of Hungary were directed by a chief rabbi; Samson Wertheimer, the famous factor of the court of Vienna, being chosen by his coreligionists to fill the office in gratitude for the interest he had shown in their welfare. His election was confirmed May 6, 1716, by the king, who also granted him permission, when he was unable to personally decide cases submitted to him, to employ representatives. Wertheimer's representatives in the Hungarian communities between 1708 and 1717 were Meïr b. Isaac, rabbi of Eisenstadt and author of "Panim Me'irot"; Alexander b. Menahem; Phinehas Auerbach; Jacob Eliezer Braunschweig; Hirsch Semnitz; and (after 1717) Simon Jolles. Wertheimer and his representatives judged especially those cases that arose in consequence of the Kurucz revolt. The Jews had fled before Rákóczy's troops as before their enemies, and Jewish communal life was for a time disorganized; but when peace was restored and the work of reorganizing the communities was begun, many difficulties arose that had to be solved by Wertheimer. Wertheimer died Aug. 6, 1724; and his death was scarcely an assured fact when his son-in-law, Bernhard Eskeles, took steps to obtain the chief rabbinate. Nineteen days later he was appointed to the office by Count Georg Erdödy, and the king confirmed the appointment Sept. 10, 1724. On the death of Eskeles (March 2, 1753) the office of chief rabbi of Hungary was abolished. 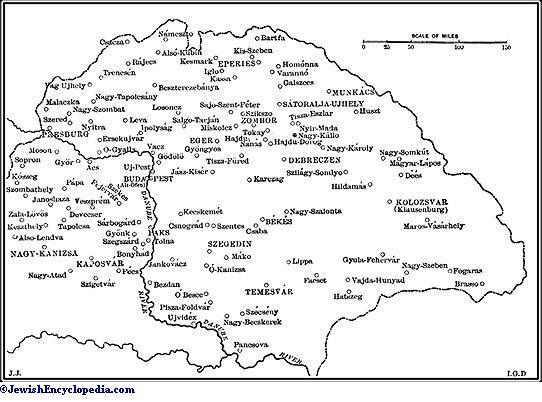 Transylvania, at the present time belonging to Hungary, had in the eighteenth and nineteenth centuries a chief rabbi of its own, who was generally the rabbi of Gyula-Fehérvár (Karlsburg). The following rabbis of this interesting community officiated as chief rabbis of Transylvania: Joseph Reis Auerbach (d. 1750); Shalom Selig b. Saul Cohen (officiated 1754-57); Johanan b. Isaac (1758-60); Benjamin Ze'eb Wolf of Cracow (1764-77); Moses b. Samuel Levi Margaliot (1778-1817); Menahem b. Joshua Mendel (1818-23); Ezekiel Paneth (1823-1843); Abraham Friedmann, the last chief rabbi of Transylvania (d. 1879). During the reign of Queen Maria Theresa (1740-1780), daughter of Charles III., the Jews were expelled from Ofen (1746), and the "toleration-tax" was imposed upon the Hungarian Jews. On Sept. 1, 1749, the delegates of the Hungarian Jews, except those from the county of Szathmár, assembled at Presburg and met a royal commission, which informed them that they would be expelled from the country if they did not pay this tax. The frightened Jews at once agreed to do so; and the commission then demanded a yearly tax of 50,000 gulden. This sum being excessive, the delegates protested; and although the queen had fixed 30,000 gulden as the minimum tax, they were finally able to compromise on the payment of 20,000 gulden a year for a period of eight years. The delegates were to apportion this amount among the districts; the districts, their respective sums among the communities; and the communities, theirs among the individual members. The queen confirmed this agreement of the commission, except the eight-year clause, changing the period to three years, which she subsequently made five. The agreement, thus ratified by the queen, was brought Nov. 26 before the courts, which werepowerless to relieve the Jews from the payment of this "Malkegeld" (queen's money), as they called it. The Jews, thus burdened by new taxes, thought the time ripe for taking steps to remove their oppressive disabilities. While still at Presburg the delegates had brought their grievances before the mixed commission that was called "delegata in puncto tolerantialis taxæ et gravaminum Judeorum commissio mixta." These complaints pictured the distress of the Jews of that time. They were not allowed to live in Croatia and Slavonia, in the counties of Baranya and Heves, or in several free towns and localities; nor might they visit the markets there. At Stuhlweissenburg they had to pay a poll-tax of 1 gulden, 30 kreuzer if they entered the city during the day, if only for an hour. In many places they might not even stay overnight. They therefore begged permission to settle, or at least to visit the fairs, in Croatia and Slavonia and in those places from which they had been driven in consequence of the jealousy of the Greeks and the merchants. They had also to pay heavier bridge-and ferry-tolls than the Christians; at Tyrnau they had to pay three times the ordinary sum, namely, for the driver, for the vehicle, and for the animal drawing the same; and in three villages belonging to the same district they had to pay toll, although there was no toll-gate. Jews living on the estates of the nobles had to give their wives and children as pledges for arrears of taxes. In Upper Hungary they asked for the revocation of the toleration-tax imposed by the chamber of Zips (Szepes), on the ground that otherwise the Jews living there would have to pay two such taxes; and they asked also to be relieved from a similar tax paid to the Diet. Finally, they requested that Jewish artisans might be allowed to follow their trades in their homes undisturbed. The commission laid these complaints before the queen, indicating the manner in which the evils could be relieved; and their suggestions were dictated in a rare spirit of good-will. The queen relieved the Jews from the tax of toleration in Upper Hungary only. In regard to the other complaints she ordered that the Jews should specify them in detail, and that the government should remedy them in so far as they came under its jurisdiction. The toleration-tax had hardly been instituted when Michael Hirsch petitioned the government to be appointed primate of the Hungarian Jews in order to be able to settle difficulties that might arise among them, and to collect the tax. The government did not recommend Hirsch, but decided that in case the Jews should refuse to pay, it might be advisable to appoint a primate to adjust the matter. Before the end of the period of five years the delegates of the Jews again met the commission at Presburg and offered to increase the amount of their tax to 25,000 gulden a year if the queen would promise that it should remain at that sum for the next ten years. The queen refused; and not only did she turn a deaf ear to the renewed gravamina of the Jews, but caused still heavier burdens to be imposed upon them. Their tax of 20,000 gulden was increased to 30,000 gulden in 1760; to 50,000 in 1772; to 80,000 in 1778; and to 160,000 in 1813. Joseph II. (1780-90), son and successor of Maria Theresa, showed immediately on his accession that he intended to alleviate the condition of the Jews, communicating this intention to the Hungarian chancellor, Count Franz Esterházy, as early as May 13, 1781. In consequence the Hungarian government issued (March 31, 1783) a decree known as the "systematicagentis Judaicæ regulatio," which wiped out at one stroke the decrees that had oppressed the Jews for centuries. The royal free towns, except the mining-towns, were opened to the Jews, who were allowed to settle at pleasure throughout the country. The "regulatio" decreed that the legal documents of the Jews should no longer be composed in Hebrew, or in the corrupt Judæo-German, but in Latin, German, and Hungarian, the languages currently used in the country, and which the young Jews were required to learn within two years. Documents written in Hebrew or in Judæo-German were not legal; Hebrew books were to be used at worship only; the Jews were to organize elementary schools; the commands of the emperor, issued in the interests of the Jews, were to be announced in the synagogues; and the rabbis were to explain to the people the salutary effects of these decrees. The subjects to be taught in the Jewish schools were to be the same as those taught in the national schools; the same text-books were to be used in all the elementary schools; and everything that might offend the religious sentiment of non-conformists was to be omitted. During the early years Christian teachers were to be employed in the Jewish schools, but they were to have nothing to do with the religious affairs of such institutions. After the lapse of ten years a Jew might establish a business, or engage in trade, only if he could prove that he had attended a school. The usual school-inspectors were to supervise the Jewish schools and to report to the government. The Jews were to create a fund for organizing and maintaining their schools. Jewish youth might enter the academies, and might study any subject at the universities except theology. Jews might rent farms only if they could cultivate the same without the aid of Christians. They were allowed to peddle and to engage in various industrial occupations, and to be admitted into the gilds. They were also permitted to engrave seals, and to sell gunpowder and saltpeter; but their exclusion from the mining-towns remained in force. Christian masters were allowed to have Jewish apprentices. All distinctive marks hitherto worn by the Jews were to be abolished, and they might even carry swords. On the other hand, they were required to discard the distinctive marks prescribed by their religion and to shave their beards. Emperor Joseph regarded this decree so seriously that he allowed no one to violate it. The Jews, in a petition dated April 22, 1783, expressed their gratitude to the emperor for his favors, and, reminding him of his principle that religion should not be interfered with, asked permission to wear beards. The emperor granted the prayer of the petitioners, but reaffirmed the other parts of the decree (April24, 1783). The Jews organized schools in various places, at Presburg, Alt-Ofen (Ó-Buda), Waag-Neustadtl (Vág-Ujhely), and Grosswardein (Nagy-Várad). A decree was issued by the emperor (July 23, 1787) to the effect that every Jew should choose a German surname; and a further edict (1789) ordered, to the consternation of the Jews, that they should henceforth perform military service. After the death of Joseph II. the royal free cities showed a very hostile attitude toward the Jews. 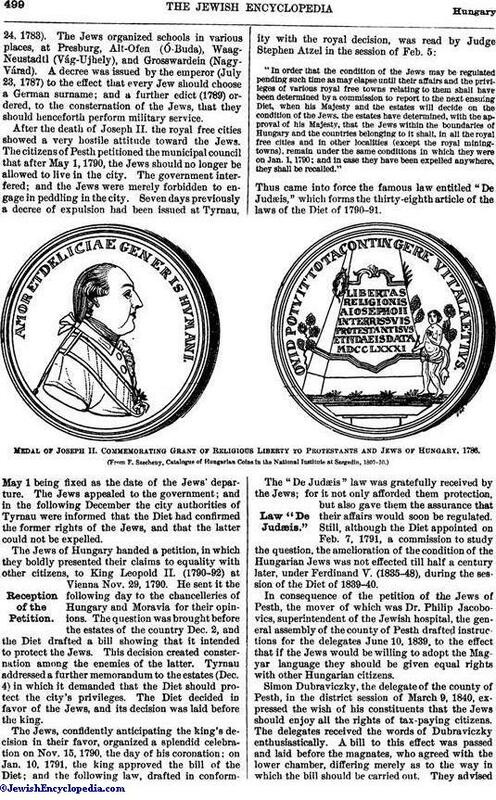 The citizens of Pesth petitioned the municipal council that after May 1, 1790, the Jews should no longer be allowed to live in the city. The government interfered; and the Jews were merely forbidden to engage in peddling in the city. Seven days previously a decree of expulsion had been issued at Tyrnau, May 1 being fixed as the date of the Jews' departure. The Jews appealed to the government; and in the following December the city authorities of Tyrnau were informed that the Diet had confirmed the former rights of the Jews, and that the latter could not be expelled. The Jews of Hungary handed a petition, in which they boldly presented their claims to equality with other citizens, to King Leopold II. (1790-92) at Vienna Nov. 29, 1790. He sent it the following day to the chancelleries of Hungary and Moravia for their opinions. The question was brought before the estates of the country Dec. 2, and the Diet drafted a bill showing that it intended to protect the Jews. This decision created consternation among the enemies of the latter. Tyrnau addressed a further memorandum to the estates (Dec. 4) in which it demanded that the Diet should protect the city's privileges. The Diet decided in favor of the Jews, and its decision was laid before the king. "In order that the condition of the Jews may be regulated pending such time as may elapse until their affairs and the privileges of various royal free towns relating to them shall have been determined by a commission to report to the next ensuing Diet, when his Majesty and the estates will decide on the condition of the Jews, the estates have determined, with the approval of his Majesty, that the Jews within the boundaries of Hungary and the countries belonging to it shall, in all the royal free cities and in other localities (except the royal mining-towns), remain under the same conditions in which they were on Jan. 1, 1790; and in case they have been expelled anywhere, they shall be recalled." Thus came into force the famous law entitled "De Judæis," which forms the thirty-eighth article of the laws of the Diet of 1790-91. Medal of Joseph II. Commemorating Grant of Religious Liberty to Protestants and Jews of Hungary, 1786. (From F. Szecheny, Catalogue of Hungarian Coins in the National Institute at Szegedin, 1807-10. )Law "De Judæis." The "De Judæis" law was gratefully received by the Jews; for it not only afforded them protection, but also gave them the assurance that their affairs would soon be regulated. Still, although the Diet appointed on Feb. 7, 1791, a commission to study the question, the amelioration of the condition of the Hungarian Jews was not effected till half a century later, under Ferdinand V. (1835-48), during the session of the Diet of 1839-40. 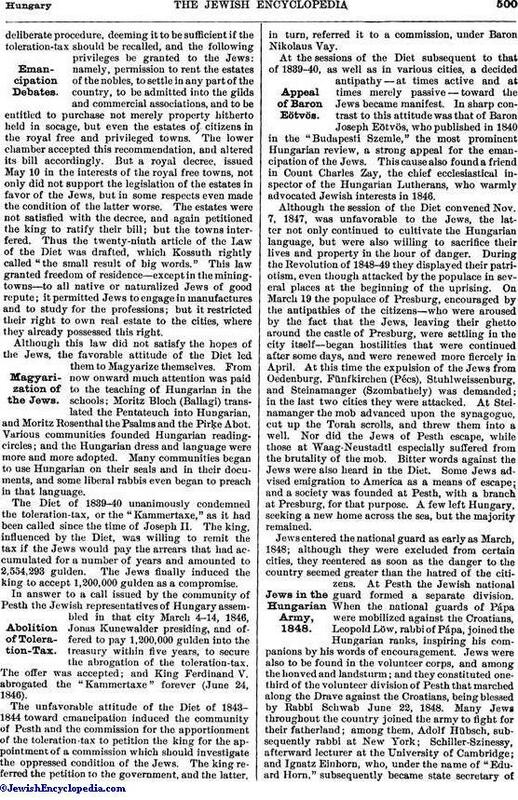 In consequence of the petition of the Jews of Pesth, the mover of which was Dr. Philip Jacobovics, superintendent of the Jewish hospital, the general assembly of the county of Pesth drafted instructions for the delegates June 10, 1839, to the effect that if the Jews would be willing to adopt the Magyar language they should be given equal rights with other Hungarian citizens. Simon Dubraviczky, the delegate of the county of Pesth, in the district session of March 9, 1840, expressed the wish of his constituents that the Jews should enjoy all the rights of tax-paying citizens. The delegates received the words of Dubraviczky enthusiastically. A bill to this effect was passed and laid before the magnates, who agreed with the lower chamber, differing merely as to the way in which the bill should be carried out. They adviseddeliberate procedure, deeming it to be sufficient if the toleration-tax should be recalled, and the following privileges be granted to the Jews: namely, permission to rent the estates of the nobles, to settle in any part of the country, to be admitted into the gilds and commercial associations, and to be entitled to purchase not merely property hitherto held in socage, but even the estates of citizens in the royal free and privileged towns. The lower chamber accepted this recommendation, and altered its bill accordingly. But a royal decree, issued May 10 in the interests of the royal free towns, not only did not support the legislation of the estates in favor of the Jews, but in some respects even made the condition of the latter worse. The estates were not satisfied with the decree, and again petitioned the king to ratify their bill; but the towns interfered. Thus the twenty-ninth article of the Law of the Diet was drafted, which Kossuth rightly called "the small result of big words." This law granted freedom of residence—except in the mining-towns—to all native or naturalized Jews of good repute; it permitted Jews to engage in manufactures and to study for the professions; but it restricted their right to own real estate to the cities, where they already possessed this right. Although this law did not satisfy the hopes of the Jews, the favorable attitude of the Diet led them to Magyarize themselves. From now onward much attention was paid to the teaching of Hungarian in the schools; Moritz Bloch (Ballagi) translated the Pentateuch into Hungarian, and Moritz Rosenthal the Psalms and the Pirḳe Abot. Various communities founded Hungarian reading-circles; and the Hungarian dress and language were more and more adopted. Many communities began to use Hungarian on their seals and in their documents, and some liberal rabbis even began to preach in that language. The Diet of 1839-40 unanimously condemned the toleration-tax, or the "Kammertaxe," as it had been called since the time of Joseph II. The king, influenced by the Diet, was willing to remit the tax if the Jews would pay the arrears that had accumulated for a number of years and amounted to 2,554,293 gulden. The Jews finally induced the king to accept 1,200,000 gulden as a compromise. In answer to a call issued by the community of Pesth the Jewish representatives of Hungary assembled in that city March 4-14, 1846, Jonas Kunewalder presiding, and offered to pay 1,200,000 gulden into the treasury within five years, to secure the abrogation of the toleration-tax. The offer was accepted; and King Ferdinand V. abrogated the "Kammertaxe" forever (June 24, 1846). The unfavorable attitude of the Diet of 1843-1844 toward emancipation induced the community of Pesth and the commission for the apportionment of the toleration-tax to petition the king for the appointment of a commission which should investigate the oppressed condition of the Jews. The king referred the petition to the government, and the latter, in turn, referred it to a commission, under Baron Nikolaus Vay. At the sessions of the Diet subsequent to that of 1839-40, as well as in various cities, a decided antipathy—at times active and at times merely passive—toward the Jews became manifest. In sharp contrast to this attitude was that of Baron Joseph Eötvös, who published in 1840 in the "Budapesti Szemle," the most prominent Hungarian review, a strong appeal for the emancipation of the Jews. This cause also found a friend in Count Charles Zay, the chief ecclesiastical inspector of the Hungarian Lutherans, who warmly advocated Jewish interests in 1846. Although the session of the Diet convened Nov. 7, 1847, was unfavorable to the Jews, the latter not only continued to cultivate the Hungarian language, but were also willing to sacrifice their lives and property in the hour of danger. During the Revolution of 1848-49 they displayed their patriotism, even though attacked by the populace in several places at the beginning of the uprising. On March 19 the populace of Presburg, encouraged by the antipathies of the citizens—who were aroused by the fact that the Jews, leaving their ghetto around the castle of Presburg, were settling in the city itself—began hostilities that were continued after some days, and were renewed more fiercely in April. At this time the expulsion of the Jews from Oedenburg, Fünfkirchen (Pécs), Stuhlweissenburg, and Steinamanger (Szombathely) was demanded; in the last two cities they were attacked. At Steinamanger the mob advanced upon the synagogue, cut up the Torah scrolls, and threw them into a well. Nor did the Jews of Pesth escape, while those at Waag-Neustadtl especially suffered from the brutality of the mob. Bitter words against the Jews were also heard in the Diet. Some Jews advised emigration to America as a means of escape; and a society was founded at Pesth, with a branch at Presburg, for that purpose. A few left Hungary, seeking a new home across the sea, but the majority remained. Jews entered the national guard as early as March, 1848; although they were excluded from certain cities, they reentered as soon as the danger to the country seemed greater than the hatred of the citizens. At Pesth the Jewish national guard formed a separate division. When the national guards of Pápa were mobilized against the Croatians, Leopold Löw, rabbi of Pápa, joined the Hungarian ranks, inspiring his companions by his words of encouragement. Jews were also to be found in the volunteer corps, and among the honved and landsturm; and they constituted one-third of the volunteer division of Pesth that marched along the Drave against the Croatians, being blessed by Rabbi Schwab June 22, 1848. Many Jews throughout the country joined the army to fight for their fatherland; among them, Adolf Hübsch, subsequently rabbi at New York; Schiller-Szinessy, afterward lecturer at the University of Cambridge; and Ignatz Einhorn, who, under the name of "Eduard Horn," subsequently became state secretary ofthe Hungarian Ministry of Commerce. The rebellious Servians slew the Jews at Zenta who sympathized with Hungary; among them, Rabbi Israel Ullmann and Jacob Münz, son of Moses Münz of Alt-Ofen. The conduct of the Jewish soldiers in the Hungarian army was highly commended by Generals Klapka and Görgey. Ignatz Einhorn estimated the number of Jewish soldiers who took part in the Hungarian Revolution to be 20,000; but this is most likely exaggerated, as Béla Bernstein enumerates only 755 combatants by name in his work, "Az 1848-49-iki Magyar Szabadságharcz és a Zsidók" (Budapest, 1898). The Hungarian Jews served their country not only with the sword, but also with funds. Communities and individuals, ḥebra ḳaddishas and other Jewish societies, freely contributed silver and gold, armor and provisions, clothed and fed the soldiers, and furnished lint and other medical supplies to the Hungarian camps. Meanwhile they did not forget to take steps to obtain their rights as citizens. When the Diet of 1847-48—in which, according to ancient law, only the nobles and those having the rights of nobles might take part—was dissolved (April 11), and the new Parliament—at which under the new laws the delegates elected by the commons also appeared—was convened at Pesth (July 2, 1848), the Jews hopefully looked forward to the deliberations of the new body. Many Jews thought to pave the way for emancipation by a radical reform of their religious life, in agreement with opinions uttered in the Diets and in the press, that the Jews should not receive equal civic rights until they had reformed their religion. This reform had been first demanded in the session of 1839-40. From this session onward the necessity of a reform of the Jewish cult was generally advocated in the press and in general assemblies, mostly in a spirit of friendliness. Several counties instructed their representatives not to vote for the emancipation of the Jews until they desisted from practising the externals of their religion. Louis Kossuth voiced the wish of nearly the whole nation when he declared in the "Pesti Hirlap" in 1844 that it was necessary to convene a Jewish Sanhedrin for the purpose of instituting reforms among the Jews. But the ideas of Reform found little response among the Hungarian Jews at this time, the community of Pesth being the most eager to adopt it. Among its advocates in that city were students at the university, teachers, physicians, and some merchants, who organized a Reform society similar to that which had been founded by rabbi Samuel Holdheim at Berlin May 8, 1845. 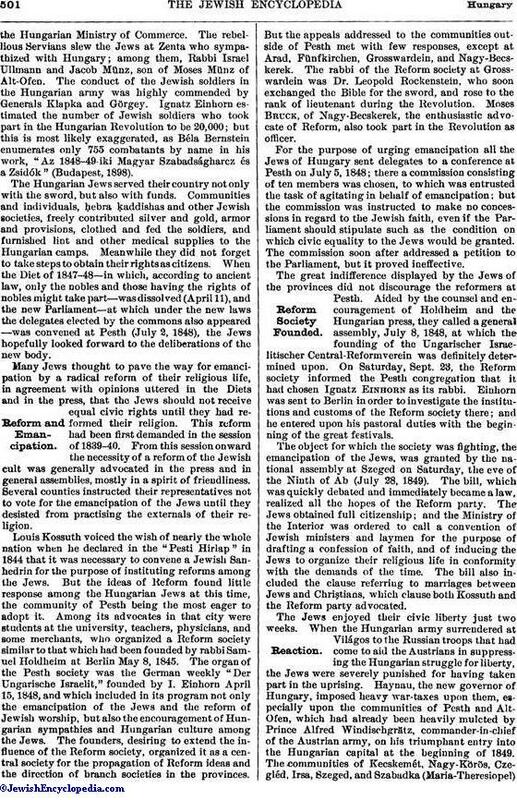 The organ of the Pesth society was the German weekly "Der Ungarische Israelit," founded by I. Einhorn April 15, 1848, and which included in its program not only the emancipation of the Jews and the reform of Jewish worship, but also the encouragement of Hungarian sympathies and Hungarian culture among the Jews. The founders, desiring to extend the influence of the Reform society, organized it as a central society for the propagation of Reform ideas and the direction of branch societies in the provinces. But the appeals addressed to the communities outside of Pesth met with few responses, except at Arad, Fünfkirchen, Grosswardein, and Nagy-Becskerek. The rabbi of the Reform society at Grosswardein was Dr. Leopold Rockenstein, who soon exchanged the Bible for the sword, and rose to the rank of lieutenant during the Revolution. Moses Bruck, of Nagy-Becskerek, the enthusiastic advocate of Reform, also took part in the Revolution as officer. 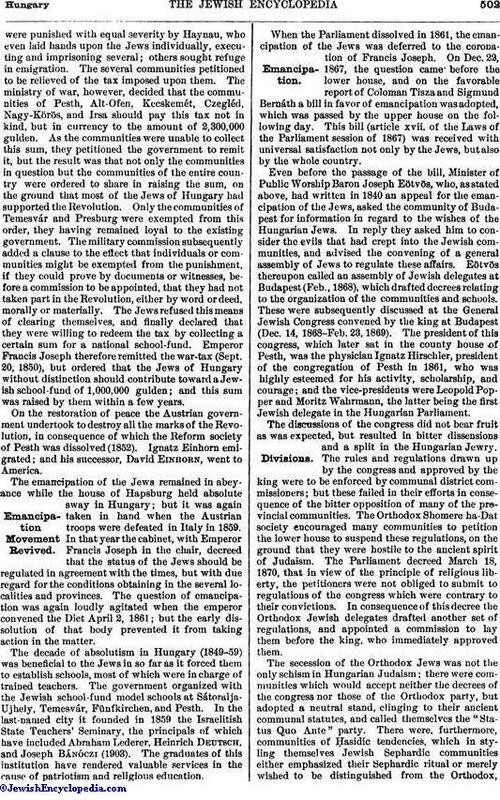 For the purpose of urging emancipation all the Jews of Hungary sent delegates to a conference at Pesth on July 5, 1848; there a commission consisting of ten members was chosen, to which was entrusted the task of agitating in behalf of emancipation; but the commission was instructed to make no concessions in regard to the Jewish faith, even if the Parliament should stipulate such as the condition on which civic equality to the Jews would be granted. The commission soon after addressed a petition to the Parliament, but it proved ineffective. The great indifference displayed by the Jews of the provinces did not discourage the reformers at Pesth. Aided by the counsel and encouragement of Holdheim and the Hungarian press, they called a general assembly, July 8, 1848, at which the founding of the Ungarischer Israelitischer Central-Reformverein was definitely determined upon. On Saturday, Sept. 23, the Reform society informed the Pesth congregation that it had chosen Ignatz Einhorn as its rabbi. Einhorn was sent to Berlin in order to investigate the institutions and customs of the Reform society there; and he entered upon his pastoral duties with the beginning of the great festivals. The object for which the society was fighting, the emancipation of the Jews, was granted by the national assembly at Szeged on Saturday, the eve of the Ninth of Ab (July 28, 1849). The bill, which was quickly debated and immediately became a law realized all the hopes of the Reform party. The Jews obtained full citizenship; and the Ministry of the Interior was ordered to call a convention of Jewish ministers and laymen for the purpose of drafting a confession of faith, and of inducing the Jews to organize their religious life in conformity with the demands of the time. The bill also included the clause referring to marriages between Jews and Christians, which clause both Kossuth and the Reform party advocated. The Jews enjoyed their civic liberty just two weeks. When the Hungarian army surrendered at Világos to the Russian troops that had come to aid the Austrians in suppressing the Hungarian struggle for liberty, the Jews were severely punished for having taken part in the uprising. Haynau, the new governor of Hungary, imposed heavy war-taxes upon them, especially upon the communities of Pesth and Alt-Ofen, which had already been heavily mulcted by Prince Alfred Windischgrätz, commander-in-chief of the Austrian army, on his triumphant entry into the Hungarian capital at the beginning of 1849. The communities of Kecskemét, Nagy-Körös, Czegléd, Irsa, Szeged, and Szabadka (Maria-Theresiopel)were punished with equal severity by Haynau, who even laid hands upon the Jews individually, executing and imprisoning several; others sought refuge in emigration. The several communities petitioned to be relieved of the tax imposed upon them. The ministry of war, however, decided that the communities of Pesth, Alt-Ofen, Kecskemét, Czegléd, Nagy-Körös, and Irsa should pay this tax not in kind, but in currency to the amount of 2,300,000 gulden. As the communities were unable to collect this sum, they petitioned the government to remit it, but the result was that not only the communities in question but the communities of the entire country were ordered to share in raising the sum, on the ground that most of the Jews of Hungary had supported the Revolution. Only the communities of Temesvár and Presburg were exempted from this order, they having remained loyal to the existing government. The military commission subsequently added a clause to the effect that individuals or communities might be exempted from the punishment, if they could prove by documents or witnesses, before a commission to be appointed, that they had not taken part in the Revolution, either by word or deed, morally or materially. The Jews refused this means of clearing themselves, and finally declared that they were willing to redeem the tax by collecting a certain sum for a national school-fund. 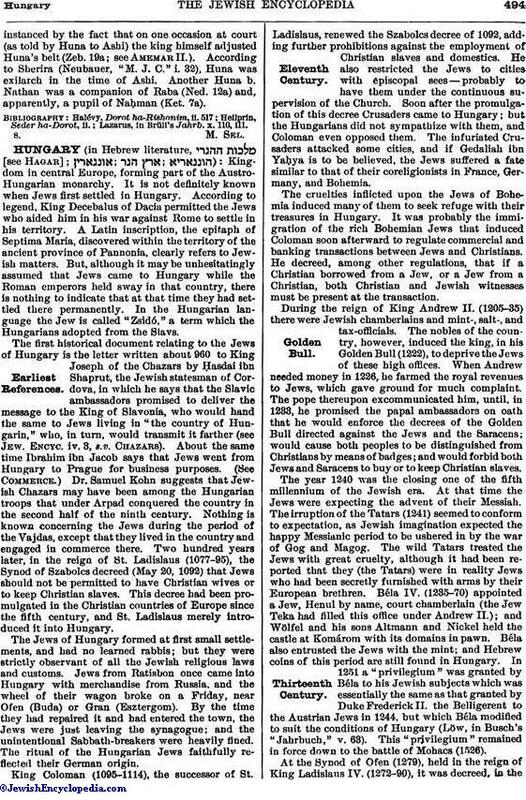 Emperor Francis Joseph therefore remitted the war-tax (Sept. 20, 1850), but ordered that the Jews of Hungary without distinction should contribute toward a Jewish school-fund of 1,000,000 gulden; and this sum was raised by them within a few years. On the restoration of peace the Austrian government undertook to destroy all the marks of the Revolution, in consequence of which the Reform society of Pesth was dissolved (1852). Ignatz Einhorn emigrated; and his successor, David Einhorn, went to America. The emancipation of the Jews remained in abeyance while the house of Hapsburg held absolute sway in Hungary; but it was again taken in hand when the Austrian troops were defeated in Italy in 1859. In that year the cabinet, with Emperor Francis Joseph in the chair, decreed that the status of the Jews should be regulated in agreement with the times, but with due regard for the conditions obtaining in the several localities and provinces. The question of emancipation was again loudly agitated when the emperor convened the Diet April 2, 1861; but the early dissolution of that body prevented it from taking action in the matter. The decade of absolutism in Hungary (1849-59) was beneficial to the Jews in so far as it forced them to establish schools, most of which were in charge of trained teachers. The government organized with the Jewish school-fund model schools at Sátoralja-Ujhely, Temesvár, Fünfkirchen, and Pesth. In the last-named city it founded in 1859 the Israelitish State Teachers' Seminary, the principals of which have included Abraham Lederer, Heinrich Deutsch, and Joseph Bánóczi (1903). The graduates of this institution have rendered valuable services in the cause of patriotism and religious education. When the Parliament dissolved in 1861, the emancipation of the Jews was deferred to the coronation of Francis Joseph. On Dec. 22, 1867, the question came before the lower house, and on the favorable report of Coloman Tisza and Sigmund Bernáth a bill in favor of emancipation was adopted, which was passed by the upper house on the following day. This bill (article xvii. of the Laws of the Parliament session of 1867) was received with universal satisfaction not only by the Jews, but also by the whole country. Even before the passage of the bill, Minister of Public Worship Baron Joseph Eötvös, who, as stated above, had written in 1840 an appeal for the emancipation of the Jews, asked the community of Budapest for information in regard to the wishes of the Hungarian Jews. In reply they asked him to consider the evils that had crept into the Jewish communities, and advised the convening of a general assembly of Jews to regulate these affairs. Eötvös thereupon called an assembly of Jewish delegates at Budapest (Feb., 1868), which drafted decrees relating to the organization of the communities and schools. These were subsequently discussed at the General Jewish Congress convened by the king at Budapest (Dec. 14, 1868-Feb. 23, 1869). The president of this congress, which later sat in the county house of Pesth, was the physician Ignatz Hirschler, president of the congregation of Pesth in 1861, who was highly esteemed for his activity, scholarship, and courage; and the vice-presidents were Leopold Popper and Moritz Wahrmann, the latter being the first Jewish delegate in the Hungarian Parliament. The discussions of the congress did not bear fruit as was expected, but resulted in bitter dissensions and a split in the Hungarian Jewry. The rules and regulations drawn up by the congress and approved by the king were to be enforced by communal district commissioners; but these failed in their efforts in consequence of the bitter opposition of many of the provincial communities. The Orthodox Shomere ha-Dat society encouraged many communities to petition the lower house to suspend these regulations, on the ground that they were hostile to the ancient spirit of Judaism. The Parliament decreed March 18, 1870, that in view of the principle of religious liberty, the petitioners were not obliged to submit to regulations of the congress which were contrary to their convictions. In consequence of this decree the Orthodox Jewish delegates drafted another set of regulations, and appointed a commission to lay them before the king, who immediately approved them. The secession of the Orthodox Jews was not the only schism in Hungarian Judaism; there were communities which would accept neither the decrees of the congress nor those of the Orthodox party, but adopted a neutral stand, clinging to their ancient communal statutes, and called themselves the "Status Quo Ante" party. There were, furthermore, communities of Ḥasidic tendencies, which in styling themselves Jewish Sephardic communities either emphasized their Sephardic ritual or merely wished to be distinguished from the Orthodox,with whom they were otherwise identical. Of these four factions of Hungarian Judaism, all of which, however, retained the same fundamental religious principles, two organized a central office at Pesth: those that adopted the regulations of the congress instituted a "central bureau"; while the Orthodox party established an "executive commission." In the midst of these dissensions, which weakened Judaism and impaired its prestige, the Theological Seminary at Budapest (as the incorporated towns of Buda and Pesth were now called) was opened Oct. 4, 1877, in spite of the bitter opposition of the Orthodox party. Its body of professors, some of whom are among the foremost Jewish scholars, as well as the students who have received their training there, have justified the expectations of its founders. After the Hungarian Jews were finally emancipated they endeavored to have their faith duly recognized as one of the legally acknowledged religions of the country. Their demand, which had already been voiced by the congress, and as early as 1848 by Leopold Löw, was frequently brought up by the Jewish central bureau and continued to form a standing subject of discussion in the Jewish press and by public men. On April 26, 1893, Minister of Public Worship Count Albin Csáky sent a bill acceding to the demand to the lower house, which in the following year passed it almost unanimously. The upper house, after twice rejecting it, finally passed it May 16, 1896. The law (article xlii. of the Laws of the Parliament of 1895) reads: "The Jewish religion is hereby declared to be a legally recognized religion." Since their emancipation the Jews have taken an active part in the political, industrial, scientific, and artistic life of Hungary. In all these fields they have achieved prominence. They have also founded great religious institutions. Their progress has not been arrested even by anti-Semitism, which first developed in 1883 at the time of the Tisza-Eszlár accusation of ritual murder. Alexander Büchler, Ignatz Acsádi, Max Pollak, Bernhard Mandl, Samuel Krausz, Béla Bernstein, and Matthias Eisler, in Evkönyv Kiadja az Izr. Magyar Irodalmi Társulat, 1896. pp. 271-286; 1897, pp. 168-188; 1898, pp. 117-124; 1900, pp. 145-166, 286-304; 1901, pp. 166-220, 221-244; 1902, pp. 7-20, 184-207, 293-304. 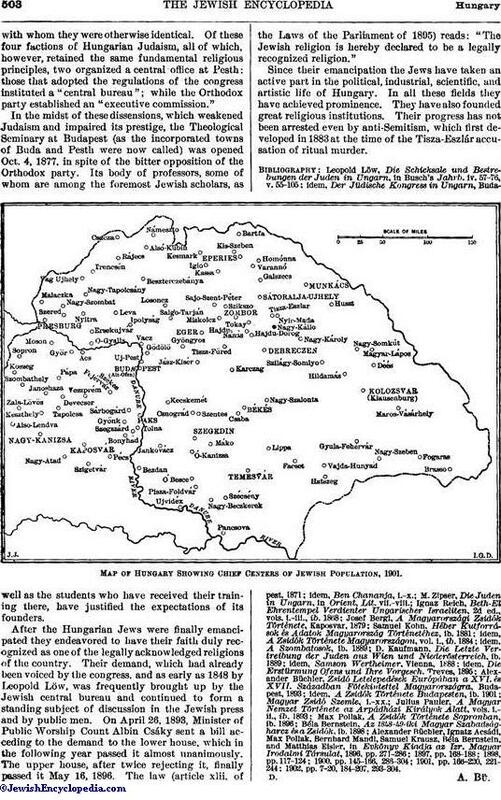 Map of Hungary Showing Chief Centers of Jewish Population, 1901.